Ecology shows us how the living world is connected to the non-living world. Either way, this chapter is looking at the physical factors that affect the patterns of where and how marine food webs get started. Despite their tremendous diversity, all organisms have the same basic needs: energy and matter. These must be obtained from the environment. Therefore, organisms are not closed systems. They depend on, and are influenced by, the environment that surrounds them. The environment includes two types of factors that affect organisms abilities to obtain energy and matter: abiotic and biotic. Abiotic factors are the nonliving aspects of the environment. They include factors such as sunlight, temperature, and pressure. Life on Earth is possible because of the flow of energy coming from the sun. The first law of thermodynamics states that “energy can not be created or destroyed, only transformed from one form to another”. Energy enters ecosystems in the form of sunlight and is transformed into edible, chemical compounds by producers (plants and algae.) Other organisms, that are not photosynthetic, will obtain energy by eating other organisms – they are consumers. Producers are organisms that produce food for themselves and other organisms. They use energy and simple inorganic molecules to make organic compounds. The stability of producers is vital to ecosystems because all organisms need organic molecules. Producers are also called autotrophs. There are two basic types of autotrophs: photoautotrophs and chemoautotrophs. Photoautotrophs use energy from sunlight to make food by photosynthesis. They include plants, algae, and certain bacteria. Chemoautotrophs use energy from chemical compounds to make food by chemosynthesis. They include some bacteria and also archaea. Archaea are microorganisms that resemble bacteria. Primary productivity is the term that oceanographers use to describe the rate at which phytoplankton and other producers convert carbon dioxide into organic compounds like sugar. Gross Primary Productivity is the total amount of organic compounds produced. Net Primary Productivity is the organic compounds left over after phytoplankton have used up the energy and resources required for them to live, grow, and reproduce. For photosynthetic phytoplankton net primary productivity is the amount of energy created in photosynthesis minus the energy used in cellular respiration. Consumers are organisms that depend on other organisms for food. They take in organic molecules by eating other living things. They include all animals and fungi, and are sometimes referred to as heterotrophs. As illustrated by this ecological pyramid, it takes a lot of phytoplankton (producers) to support the carnivores of the oceans. Heterotrophs can be classified by what they eat: herbivores or carnivores. Herbivores are grazers, and in the ocean that means they eat phytoplankton. There is a necessary link between producers and other consumers. Marine examples include zooplankton, some baleen whales, and small fish. Carnivores consume other animals. Marine examples include tuna, salmon, many sharks, and killer whales. Energy is transferred from producers to other organisms in a series of steps. These steps are known as trophic levels. The greatest “biomass”, or mass of organisms, occurs at the lowest levels. Phytoplankton are far more abundant, and collectively more massive, than fish or marine mammals. For each level you go up, the amount of energy present in the level diminishes. When a Right Whale eats one ton of phytoplankton, it does not gain a ton in new mass. Most of the energy is lost to the system, in the form of movement and heat. Typically, only about 10% of the energy is passed into the next level. This loss of energy explains why there are rarely more than four trophic levels in a food chain or web. Sometimes, there may be a fifth trophic level, but usually there’s not enough energy left to support any additional levels. Some factors are density dependent; the factor becomes more significant as a local population of organisms increases. These density dependent factors can limit the growth of a single organism, or of a whole population of organisms. We call these limiting factors. Imagine an automobile factory that loses a shipment of steering wheels. They have enough parts to make thousands of cars but only five steering wheels – how many cars do they make? For any organism or population of organisms there will be one or more “limiting factor” that limits growth. For photosynthetic organisms (like kelp or phytoplankton) are often limited by nutrients such as nitrogen or phosphorus. 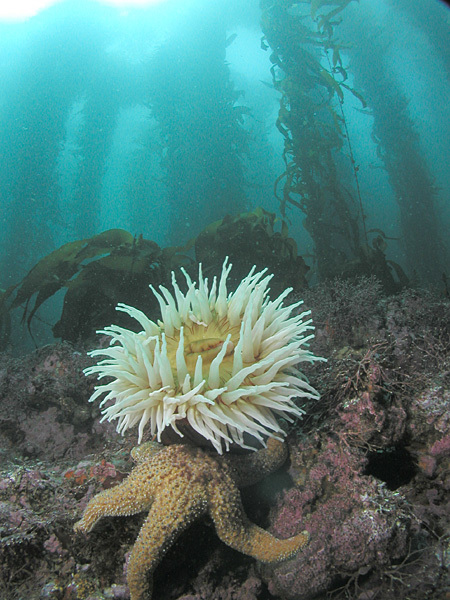 Organisms that eat other organisms are often limited by food availability or the abundance of predators that may eat them. Carbon is one of the most common elements found in living organisms. Chains of carbon molecules form the backbones of many molecules, such as carbohydrates, proteins, and lipids. Carbon is constantly cycling between living organisms the atmosphere (Figure right). The cycling of carbon occurs through the carbon cycle . Living organisms cannot make their own carbon, so how is carbon incorporated into living organisms? In the atmosphere, carbon is in the form of carbon dioxide gas (CO2). Recall that plants, algae, and other producers capture the carbon dioxide and convert it to glucose (C6H12O6) through the process of photosynthesis. Then, as animals eat plants or other animals, they gain the carbon from those organisms. The chemical equation of photosynthesis is 6CO 2 + 6H2O → C6H12O6 + 6O2 . How does this carbon in living things end up back in the atmosphere? Remember that we breathe out carbon dioxide. This carbon dioxide is generated through the process of cellular respiration, which has the reverse chemical reaction as photosynthesis. That means when our cells burn food (glucose) for energy, carbon dioxide is released. We, like all animals, exhale this carbon dioxide and return it back to the atmosphere. Also, carbon is released to the atmosphere as an organism dies and decomposes. Cellular respiration and photosynthesis can be described as a cycle, as one uses carbon dioxide (and water) and makes oxygen (and glucose), while the other uses oxygen (and glucose) and makes carbon dioxide (and water). The carbon cycle. The cycling of carbon dioxide in photosynthesis and cellular respiration are main components of the carbon cycle. Carbon is also returned to the atmosphere by the burning of fossil fuels and decomposition of organic matter. Like carbon, nitrogen is also repeatedly recycled through the biosphere. This process is called the nitrogen cycle . Nitrogen is one of the most common elements in living organisms. It is important for creating both proteins and nucleic acids, like DNA. The air that we breathe is mostly nitrogen gas (N 2 ), but Nitrogen gas is not easily available to living organisms. Nitrogen gas (N 2 ) has two nitrogen atoms connected by a very strong triple bond, which can not be broken by most animals and plants. In fact, plants often die from a lack of nitrogen even through they are surrounded by plenty of nitrogen gas. Most plants and animals cannot use the nitrogen in nitrogen gas because they cannot break that triple bond. Certain bacteria, however, are quite good and breaking those bonds and will have a nitrifying effect on the surrounding water and soil. The form of nitrogen most easily taken up by phytoplankton is nitrate. Nitrate can get into the ocean when lightening strikes. The extreme heat breaks the bonds of N2 gas. More often, it gets it is washes inted oceans from rivers draining forests and farm lands. The natural decay of plant material and the release of animal waste puts nitrates into water. Whale feces, is a tremendous source of nitrates in the surfaces waters of the ocean. Many coastal and shallow areas in the ocean are limited in nitrates for much of the year. Seasonal plankton blooms use up nitrogen that may have been brought up from the bottom by upwelling or winter storms. Once that nitrogen has been incorporated into phytoplankton it is either eaten by other organisms or the plankton die and sink to the bottom, taking their nitrates with them. When excessive fertilizer, from farms, golf courses, or peoples yards, run’s into the ocean it can create excessive growth of phytoplankton. 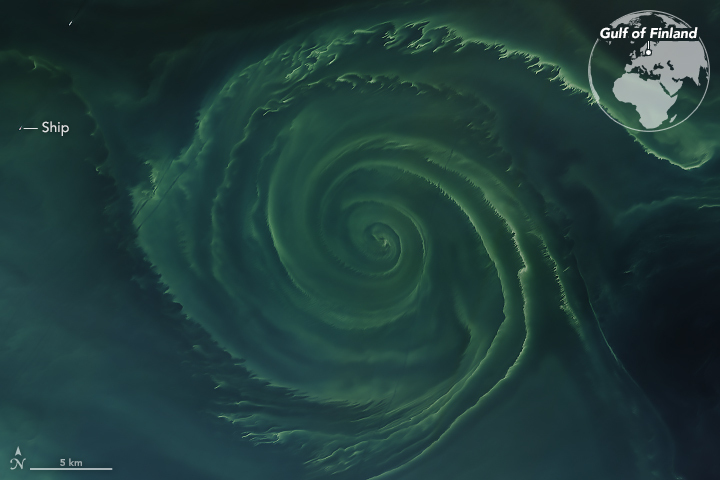 When these phytoplankton bloom in large numbers, many die and sink to the bottom. Here they are decomposed by bacteria in a process that robs the water of critical oxygen. So called dead zones exist now in many parts of the world. Using the ecological pyramid in the text above, how many kg of phytoplankton would it take to grow 100 kg of fish? Describe the difference between gross and net primary productivity. The growth of plankton is controlled by limiting nutrients. Read the blog post and describe what nutrient limits life for most of the ocean? Despite this, too much nutrients can cause real problems for the ocean. Read the link, describe what I mean. Examine what has happened with algae blooms in Lake Erie. What is the problem these blooms are causing, what nutrient level’s are too high, and what is the source of these nutrients. Click on the link “Marine Food Webs.” The four dominant primary producers in the ocean are diatoms, dinoflagellates, Coccolithophores, and photosynthetic bacteria. How are these organisms different from the plants that are primary producers on land? Describe the conditions that have lead to large plankton blooms in the Gulf of Finland last summer. These large plankton blooms, in turn, are leading to conditions that are difficult for fish to thrive. Explain the connection between large plankton blooms and poor conditions for fish. Harmful Algae Blooms (HABs) happen when certain types of plankton release small amounts of toxic chemicals into the water. Large blooms of plankton may concentrate those toxins with devastating effects. Read about and describe the HAB that devastated the Gulf Coast of Florida in 2018. If you don’t get enough you can read this as well: Miami Herald. (2pts) Follow directions from your teacher in class, or read them yourself here. Use the Nauplius data explorer to define what months nitrogen, phosphorus, and silicate are most available in the Gulf of Alaska, and what months they are least available. Do your best to explain why the levels of these nutrients go up and down.